You hear that blood 'n gore maestro Eli Roth (he of the Hostel flicks) is making a Halloween movie and the last thing to expect is a kid friendly treat like The House with a Clock in its Walls. 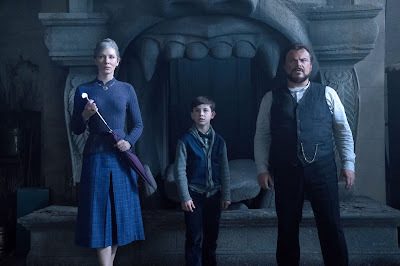 A Spielberg-esque adventure (it's produced by Amblin Entertainment, after all) full of modest frights and lots of magic, the film marks Roth's latest diversion away from the horror genre and is far more enjoyable than his recent Death Wish remake. While he's always been given to explicit displays of violence rather than psychological scares, Roth shows a surprising skill for the warm-hearted, whimsical, and weird. This oddball confection is set in 1955, free from the cold, impersonal technology that I think has made modern day horrors less effective. Illustrator Edward Gorey's creepy, mischievous art translates well to the big screen, capturing the shadowy corners of an old Victorian home. That's where we're introduced to Lewis (Owen Vaccaro), a shy young orphan who has been sent to live there with his bizarre uncle Jonathan (Jack Black) in a small Michigan town. Turns out Jonathan's house is just as strange as he is; while he walks around decked out in kimonos and unfortunate hats, his house is full of ticking clocks, dozens of them. Bright stained-glass windows, a terrifying amount of life-sized dolls, and other dusty antiques cast a cryptic pall over the place, but it is by no means boring. Turns out, Lewis' uncle isn't just an eccentric, he's a warlock, and his home is full of magical things, like a living chimera topiary, a sofa that behaves like a dog, and stained-glass window is never the same twice. Jonathan isn't a powerful warlock but his neighbor and best friend, the purple-clad Florence Zimmerman (Cate Blanchett), is powerful although a past tragedy has affected her confidence. She's feisty, though, and trades insults with Jonathan like an old married couple. Don't tell them that, though. Still, Lewis is lonely and just wants to make friends. He wears a sentimental pair of goggles that make him an outcast around school, and he carries an8-ball that he hopes will bring messages from his dead parents. The lengths Lewis goes to cure his loneliness eventually get him and his newfound family into big trouble. The best part of the film is its colorful cast of characters, including the house itself, a virtual treasure chest of curiosities and whatnot. It's perfect for a young boy like Lewis to explore and get into trouble with, like that huge vault door Jonathan warns him never to open. Of course, it WILL get opened at some point. Kids will also be drawn in by the wonderful visuals, with credit going to the film's talented production team. A scene where they fight a horde of attacking jack o'lanterns is matched in creepiness only by the living dolls, which made my skin crawl at the thought of their touch. *shudders* While I found Vaccaro's performance as Lewis lacking in childlike spark, it was more than matched by the playful banter between Black and Blanchett. While we expect Black to be a little off his rocker, Blanchett is delightfully nutty here, as well. Screenwriter Eric Kripke knows how to have fun with the supernatural, literally, as creator of the long-running CW series, Supernatural. He walks a tonal balance between scares and humor that doesn't always fit, and gets lost when the plot actually gets set into motion. When Lewis inadvertently resurrects the evil mage Isaac Izard (Kyle MacLachlan), it sets off a chain of convoluted and less-interesting events when all we really want to do is explore the wonders of this spellbinding world. The occasional blood ritual and talk of making keys out of a dead wife are about as close as it gets to resembling an Eli Roth movie. Bellair's novel led to a number of sequels, and if a hit The House with a Clock in its Walls will probably get at least one. It comes across a little like Harry Potter-lite, but the gothic setting and unique array of characters create their own kind of magic worth paying a visit to this Halloween.